On the 22nd of May, 1990, version Windows 3.0 was released. It had an improved program manager and icon system, a new file manager, support for sixteen colors and improved speed and reliability. Maybe the most important thing was that Windows 3.0 benefited from widespread third-party support. Programmers started writing Windows-compatible software, making this version more appealing to customers. Three million copies were sold the first year. 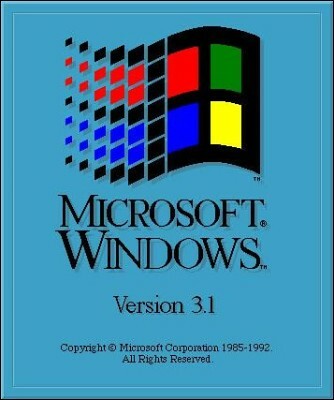 On the 6th of April, 1992 Windows 3.1 was released. Three million copies were sold in the first three months. The attractiveness of the 3.x Windows versions consisted in improvement of the design, partially due to the fact that the virtual memory and the loadable virtual drivers (VxDs) allowed the versions to share arbitrary devices between multitasked DOS windows. Windows applications could now run in protected mode, like in Standard or 386 Enhanced Mode, which gave them access to several megabytes of memory and removed the obligation to participate in the software virtual memory scheme. They still occurred inside the same address space, where the segmented memory provided a degree of protection, and multi-tasked cooperatively. For Windows 3.0, Microsoft also rewrote critical operations from C into assembly, making this release faster and less memory-hungry than its predecessors. Succeeding Windows 2.1x, the Windows 3.0 included a significantly revised user interface as well as technical improvements to make better use of the memory management capabilities of Intel's 80286 and 80386 processors. Text-mode programs that were written for MS_DOS could be run within a window thus making the system usable as a crude multitasking base for legacy programs. Although this feature was previously available in a more limited form with Windows 386/ 2.1, in version 3.0 it was of limited use for the home market, where most games and entertainment programs continued to require raw DOS access. Among the changes that Microsoft thinkers made to version 3.0 of Windows was that the MS-DOS Executive file manager, or the program launcher, was replaced with the icon-based Program Manager and the list-based File Manager, thereby simplifying the launching of applications. The MS-DOS Executive was also included as an alternative to these features. The Control Panel, previously available as a standard looking applet, which meant that it run in the context of another program performing a very narrow function with no independent use, was remodeled after the one in the Mac OS. It centralized system settings, including limited control over the color scheme of the interface. Also, a number of simple applications were included, such as the text editor Notepad and the word processor Write, both inherited from earlier versions of Windows. It also included a macro recorder, which was a new thing but latter abandoned, and a calculator. The previous Reversi game was completed with a card game named Solitaire. TrueType scalable font support was added, along with multimedia capability, object linking and embedding (OLE), application reboot capability, and more. Windows 3.0 was the last version of Windows to advertise 100% compatibility with older Windows applications, but this only applied to real mode running. Windows 3.x became the number one operating system installed in PCs until 1997, when Windows 95 took over.